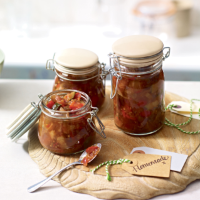 Chutney is one of the best store-cupboard staples to have on hand and is a great way to use up a glut of seasonal veg. Adapt the recipe to whatever veggies you have available or growing in the garden. Once opened, use within 2 weeks.